Spring is here, and it’s time to start eating weeds again. 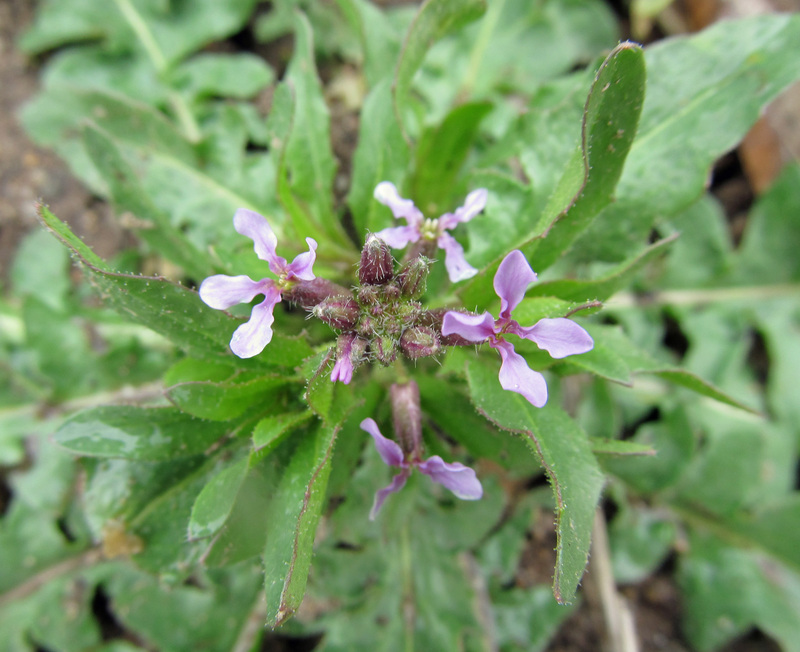 One of the earliest edible weeds to emerge in the spring is Chorispora tenella, commonly known by many names including blue mustard, crossflower, and musk mustard. Introduced to North America from Russia and southwestern Asia, this annual mustard has become commonplace in disturbed areas, and is particularly fond of sunny, dry spots with poor soil. It can become problematic in agricultural areas, but to those who enjoy eating it, seeing it in large quantities isn’t necessarily viewed as a problem. The plant starts off as a rosette. Identifying it can be challenging because the shape of the leaves and leaf margins can be so variable. Leaves can either be lance-shaped with a rounded tip or more of an egg shape. Leaf margins are usually wavy and can be deeply lobed to mildly lobed or not lobed at all. 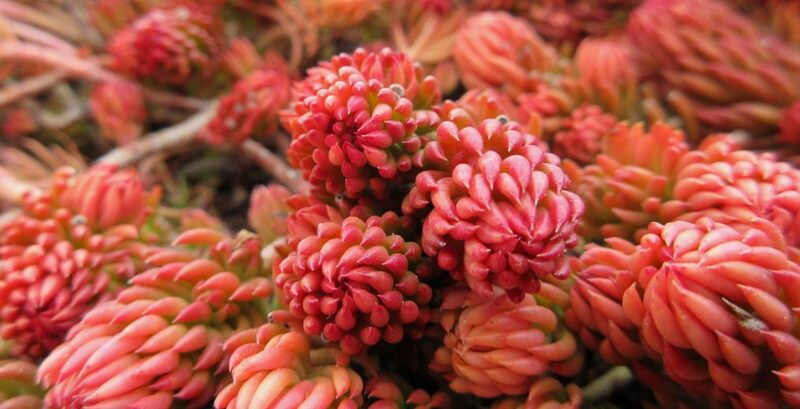 Leaves are semi-succulent and usually covered sparsely in sticky hairs, a condition that botanists refer to as glandular. A leafy flower stalk rises from the rosette and reaches between 6 and 18 inches tall. Like all plants in the mustard family, the flowers are four-petaled and cross-shaped. They are about a half inch across and pale purple to blue in color. Soon they turn into long, slender seed pods that break apart into several two-seeded sections. Splitting apart crosswise like a pill capsule rather than lengthwise is an unusual trait for a plant in the mustard family. Multiple sources comment on the smell of the plant. Weeds of North America calls it “ill-scented.” Its Wikipedia entry refers to it as having “a strong scent which is generally considered unpleasant.” The blog Hunger and Thirst comments on its “wet dish rag” smell, and Southwest Colorado Wildflowers claims that its “peculiar odor” is akin to warm, melting crayons. 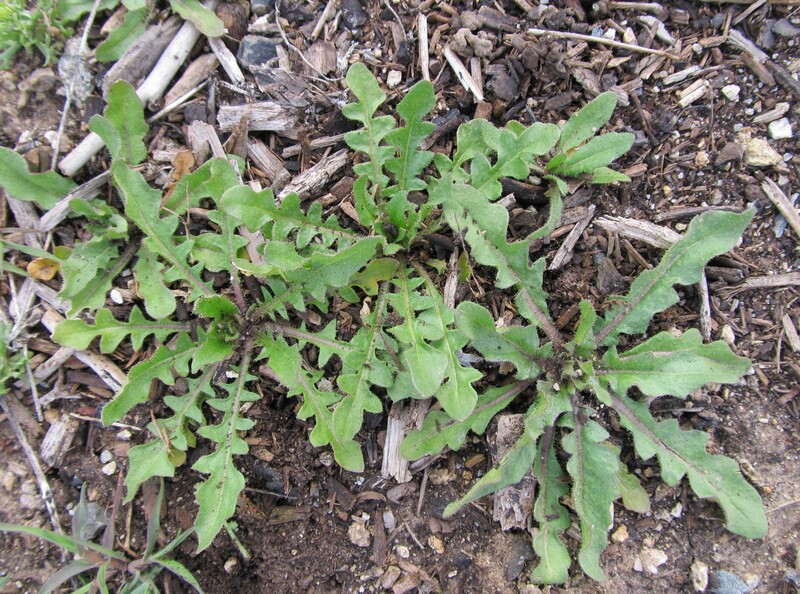 Weeds of the West says it has a “disagreeable odor,” and warns of the funny tasting milk that results when cows eat it. All this to say that the plant is notorious for smelling bad; however, I have yet to detect the smell. My sense of smell isn’t my greatest strength, which probably explains why I’m not picking up the scent. It could also be because I haven’t encountered it growing in large enough quantities in a single location. Maybe I’m just not getting a strong enough whiff. Regardless of its smell, for those of us inclined to eat weeds, the scent doesn’t seem to turn us away. The entire plant is edible, but the leaves are probably the part most commonly consumed. The leaves are thick and have a mushroom-like taste to them. They also have a radish or horseradish spiciness akin to arugula, a fellow member of the mustard family. I haven’t found them to be particularly spicy, but I think the spiciness depends on what stage the plant is in when the leaves are harvested. I have only eaten the leaves of very young plants. The leaves are great in salads and sandwiches, and can also be sauteed, steamed, or fried. 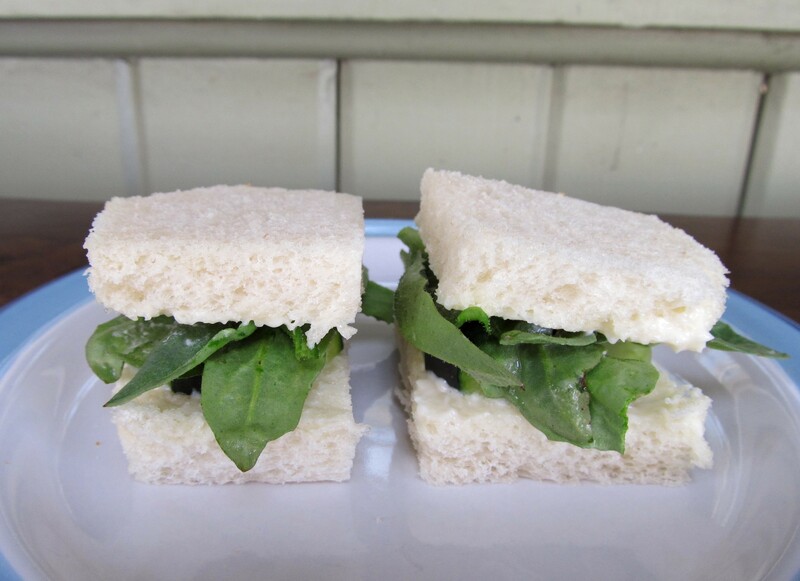 I borrowed Backyard Forager’s idea and tried them in finger sandwiches, because who can resist tiny sandwiches? I added cucumber to mine and thought they were delicious. If you’re new to eating weeds, blue mustard is a pretty safe bet to start with – a gateway weed, if you will. For more information about blue mustard, go here.